The vulcanic Eolie or Lipari Islands are one of the most enchanting and charming spots in Sicily. Turism here is huge in the summer, but in spite of all every single island keeps its own character: wild to explore and live or relaxing, mostly for young or mostly for the so called vip, full of calm beaches or imponent due to the vulcanic eruptions. Which have they in common? Of course the sea: the wild force of the tides can isolete the islands sometimes for days because of its high tides and deep waters. The Eolie islands (ME) are north of Capo Milazzo, between Messina and Cefalù and they are connected all year to Milazzo and to Napoli by boat. 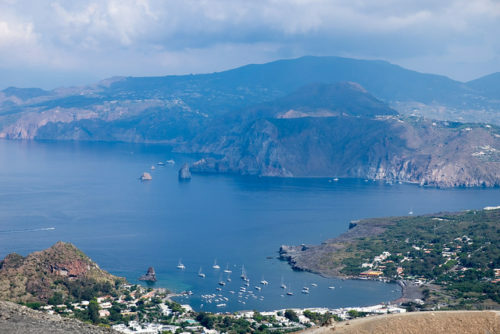 Lipari is the biggest island, with hot water sources which springs in many areas; to visit here the Norman cathedral and the Archeological Eoliano Museum. Amazing will be to go and enjoy the Belvedere Quattrocchi, at the Terme of San Calogero and the Acquacalda beach: this was the arrival point for ships coming to the island to load pumice stones. Salina is peculiar as well: the 962 meters of Monte Fossa of Felci dominates the island, and its characteristic is the underbrush. on the Islands three towns are ready to welcome you: Santa Maria, Leni and Malfa. Close by Salina, but going to the south, you will find Vulcano the island dedicated to Efesto, magnificent Greek god of the fire. The island has been descripted by Omero as home for the god of the winds, Eolo. Here there are three craters, two not active and one, the Gran Cratere, still active and alive: the last eruption was in 1890!. On the same note, let’s meet an everlasting active vulcano, the one in the northwest of Stromboli! From Ginostra or from Piscitrà go to the old vulcanic Observatory and rise up to the highest crater: you will find a guide tour also at night when the spectacular eruptions are totally clear! After all this exciting trip in the heart of vulcanos, keep on going and visiting the mundane Panarea, surrounded by high walls and really crowded. The last two of this seven sisters of the sicialian sea are Alicudi and Filicudi, the quietest islands, where to find peace and rest. This entry was posted on Monday, August 13th, 2012 at 10:04 pm	and is filed under Discover Italy. You can follow any responses to this entry through the RSS 2.0 feed. You can leave a response, or trackback from your own site.